Experts will talk at our Get Into Games section of the Weekender on February 17 and 18. Ever wanted to become a community manager in the games industry? How about a 2D animator, or an artist, or working in esports? 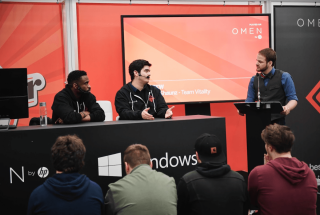 New to the PC Gamer Weekender this year is our Get Into Games careers area, where across two days, a wide range of talent from across the industry will share insight on their careers, while offering advice you can use to help or build your own. Speakers from the likes of Creative Assembly, ESL UK and many more will offer talks that cross a huge range of games industry disciplines. You can see the full schedule here, but the PC Gamer team will also make an appearance to discuss working in games media, if any of you ever wondered what a life of uploading pictures of Geralt from The Witcher in the bath is like. On top of that, the universities of Sunderland and Suffolk will be in attendance to discuss undergraduate computer courses. Both universities will be able to answer your questions about what the study of games and gaming is like. Come along, and learn a whole lot that can help shape your future. The PC Gamer Weekender is on 17-18 February at the London Olympia. Tickets start at £12.99, but you can save 20% by applying the code PCG.